The plant hormone abscisic acid (ABA) regulates many aspects of plant growth and development, plays an important role in adaptive responses to environmental stress and is a key regulator of stomatal aperture. Genetic studies in Arabidopsis have identified several factors that participate in ABA signal transduction, including factors that act primarily in seed or vegetative responses as well as core components that affect most tissues and responses. In spite of its success for other aspects of the pathway, forward genetic approaches have failed to identify ABA receptors. Using alternate approaches, three proteins that bind ABA have recently been identified. The picture to emerge from these studies is that the multiple functions of ABA may be executed by a multiplicity of receptors. A detailed understanding of ABA perception and signal transduction is a major goal in plant biology. As part of a wider chemical genetic initiative, members of the Cutler lab uncovered a new naphthalene sulfonamide hypocotyl cell expansion inhibitor called pyrabactin (for pyridyl containing ABA activator). A combination of physiological, genetic and transcriptomic data show that pyrabactin is an agonist of the seed ABA signaling pathway. 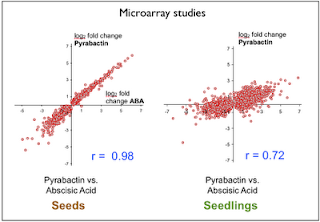 Pyrabactin shows poor agonist activity in seedling assays, suggesting it is seed-selective. Pyrabactin is the first agonist of the ABA pathway that is not structurally related to ABA and may be useful as a template for future agrichemicals that modulate the ABA pathway. In the Cutler lab, target identification is usually tackled using genetic strategies. A genetic screen for pyrabactin resistant mutants showed that a locus called Pyr1 Pyrabactin resistance 1) is necessary for pyrabactin agonist activity. Pyr1 was isolated by map based cloning and determined to encode a putative ligand-binding protein in the START domain super family. Structurally, members of this family are characterized by the presence of a conserved hydrophobic ligand-binding pocket, otherwise their functions in vivo are poorly defined . One theme in plant signal transduction is that plant hormones often induce downstream effects by modulating protein-protein interactions between receptors and effectors. In this context, we hypothesized that pyrabactin might work by binding to PYR1 and inducing a protein-protein interaction that regulates ABA signaling. To test this idea, a yeast two-hybrid (Y2H) screen using PYR1 as bait was performed with pyrabactin added to the yeast growth medium. 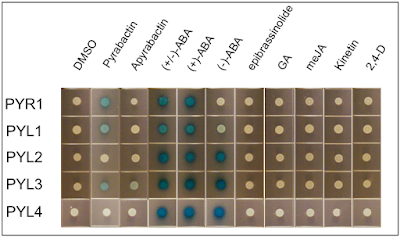 This screen successfully identified pyrabactin induced protein-protein interactions that are being characterized in the lab. Of note, ABA is also able to regulate PYR1 protein-protein interactions in the Y2H assay, which suggests that PYR1 could be a new ABA receptor. Current experiments in the lab are focused on building a deeper understanding the role of PYR1 and related proteins in ABA signaling . You have done just a Great Great Great job guys!!! I will do my next Journal Club with your results.